The Jordanian newspaper al-Ghad (Tomorrow) is reporting that the commander of the Jerusalem Brigade of the Iranian Revolutionary Guards has been spotted near Latakia, urging on a volunteer militia of Alawite Shiites. The report comes as AP says it was told by a senior Western official that 1500 Iranian Revolutionary Guards Corps (IRGC) troops have assembled in Syria for the campaign to link Hama and Latakia to the northern metropolis of Aleppo. A wave of Shiite Hizbullah fighters from Lebanon has also gone to the front just north of Hama. 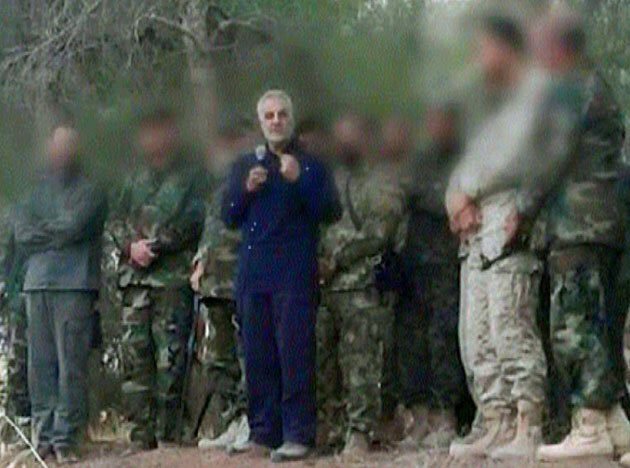 Qasem Soleimani, the commander of Iran’s special operations forces, appears to have been urging on an Alawite militia, which may be preparing to join a Syrian Arab Army attack on Jisr al-Shughour. This town in the Ghab valley lies between Latakia and Idlib city, the capital of the province of the same name. The Army of Conquest, a coalition of hard line Salafis that includes al-Qaeda in Syria, took Jisr al-Shughour recently, from which it can menace the Alawites of Latakia to the west. Jisr al-Shughour had some 44,000 residents before 2011, most of them conservative Sunnis. Many of them fled the town while it was under the control of the Syrian Arab Army. Qatar-backed London daily, Al-Arabi al-Jadid , also alleged Iranian troops in Syria, though it says many of them are actually Afghans living in eastern Iran, having been displaced by the Afghanistan wars. At one point there were two million Afghan refugees and guest workers in Iran, most of them Tajiks or Hazaras. The paper says that as of last summer some 400 Iranian fighters had been killed in Syria. In contrast, al-Hayat says, Russia wants to build up the central Syrian Arab Army and reduce the al-Assad regime’s dependence on militias. The recent advances of Daesh (ISIS, ISIL) and allies in Idlib province just east of the port of Latakia alarmed Iran and Russia and led to the current round of fighting. The Syrian Arab Army, the Russian Air Force, Hizbullah and a demi-brigade of the IRGC are attempting to clear rebels from the areas north of Hama and extending up to Jisr al-Shaghour, as a way a recovering territory the regime lost to the rebels last spring and through this summer.